Odyssey will also be revisiting the exploration mode that many people liked from Origins. Discovery Tour will educate players about ancient Greece’s monuments, history, and culture. Like Origins, they will be able to explore the world without having to worry about combat. Weekly and daily “contracts” will be handed out, and players will have to track down an epic mercenary or ship to defeat. These will be challenging foes that might require multiple players to take down. The devs are also working on a New Game Plus mode to come out after release, as well as new monsters and mythical beasts. All of the above content will be free for everyone. The company also has a ton of perks and exclusive content for Season Pass holders. The $40 optional pass notably includes two bonus games at launch — Assassin’s Creed III Remastered and Assassin’s Creed III: Liberation Remastered. The pass also includes two additional story arc packages. Legacy of the First Blade will introduce players to the first assassin to wield the hidden blade (hint: It was a caveman — just kidding). The story will apprise players of the backstory behind the assassins. The content will be episodic and start dripping out in December. Each episode will be about six weeks apart. The Fate of Atlantis is the second story arc DLC. It has players discovering the secrets of mythical Atlantis and confronting "godly creatures." The content will be focused on Greek mythology and the First Civilization. Episodes will start arriving in the Spring of 2019, also spaced six weeks apart. 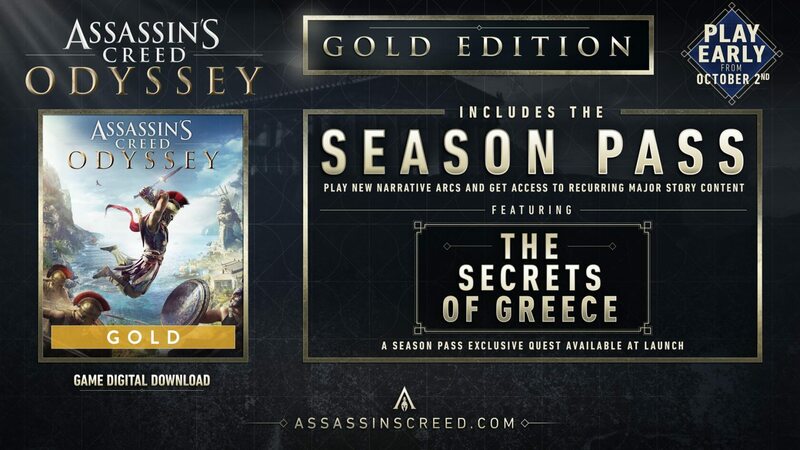 If you want to get cut a break on the $40 Season Pass entrance fee, there will be several bundles available including Gold, Digital Ultimate, Medusa, Spartan, and Pantheon Editions, which all include the Season Pass and other goodies. There are also the Standard and Deluxe Editions, but they do not include the Season Pass. Pricing has not been announced yet, but you can expect to pay $60 for the standard game. Bundles will probably increment in price by about $10-20 as you go up the line. 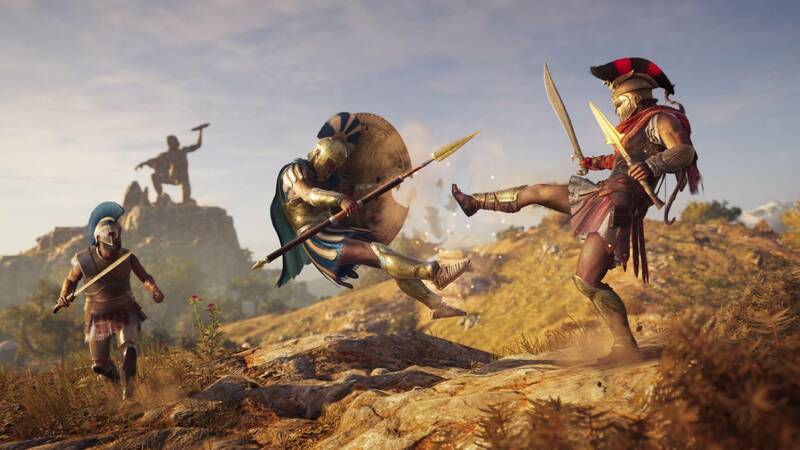 Assassin’s Creed Odyssey is set to release on October 5 for PS4, XB1, and PC. Some of the digital bundles have an early access perk that will allow you to start playing on October 2. AC2 was probably my favorite out of the series. The first was awesome too just for the fact that it was so ground breaking, but I did find 2 more interesting and entertaining. So they keep some of the content timed so they can cajole people into their store front (game) more often and for a longer period. If I buy a single player game I don't want no services for two years, I just want to play the game for couple of days and be done with it. Yawn. Another AC game. It's still the same game with a new coat of paint and more bugs then the amazon rain forest. Ubisoft had a great idea with origins, take a break from releases! "The more you have of something, the less value you can gain from it." is a lesson ubisoft should learn sooner or later.